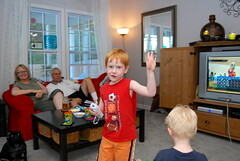 My family came over tonight for chili eating and Wii playing. I made a ginormous batch of beer & black bean chili. YUM. Gigi (my mom) brought over yummy corn muffins. 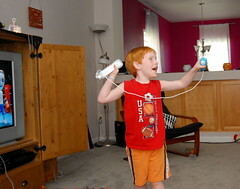 But the highlight of the evening was playing the Wii with my nephews Jacob and Joey. OMG they are just too cute. 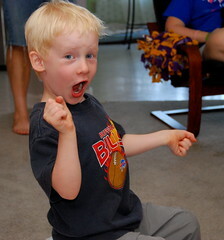 Joey gets SO EXCITED for everyone. I’ve never been cheered for so much while bowling. But then he bowled a strike and we WENT WILD. He stood there silently, staring at the screen. 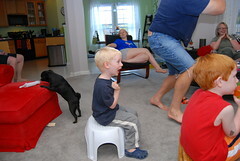 When the cheering stopped he turned and said “Uncle Jon’s turn!” Cracked us up. Jacob gets very serious about the whole thing. And if I bowled a sub-par turn, he’d turn to me and say “Aunt Shanny, you just gotta throw it right down the middle, ok?” Ok. Thanks coach! 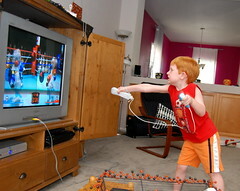 Our BIL Marc gets just as into the Wii as his sons do. I don’t know what’s more fun, playing or watching other people play! You can see all the pics I took here.